Art Laffer, the architect of Ronald Regean’s economic plan, writes in today’s Wall Street Journal why Gingrich has a “significantly better” tax plan that Romney. Ockham’s razor, (the law of parsimony, economy or succinctness), is a principle that generally recommends that, from among competing hypotheses, selecting the one that makes the fewest new assumptions usually provides the correct one, and that the simplest explanation will be the most plausible until evidence is presented to prove it false. If we judge both leading contenders in the Republican primary, Newt Gingrich and Mitt Romney, by what they’ve done in life and by what they propose to do if elected, either one could be an excellent president. But when it comes to the election’s core issue—restoring a healthy economy—the key is a good tax plan and the ability to implement it. Mr. Gingrich has a significantly better plan than does Mr. Romney, and he has twice before been instrumental in implementing a successful tax plan on a national level—once when he served in Congress as a Reagan supporter in the 1980s and again when he was President Clinton’s partner as speaker of the House of Representatives in the 1990s. During both of these periods the economy prospered incredibly—in good part because of Mr. Gingrich. When it comes to economic efficiency, nothing holds a candle to a low-rate, simple flat tax. As I explained in a op-ed on this page last spring (“The 30-Cent Tax Premium,” April 18), for every dollar of net income tax collected by the Internal Revenue Service, there is an additional 30¢ paid out of pocket by the taxpayers to maintain compliance with the tax code. Such inefficiency is outrageous. Mr. Gingrich’s flat taxes would go a lot further toward reducing these additional expenses than would Mr. Romney’s proposals. Mr. Gingrich’s tax proposal is not revenue-neutral, nor should it be. If there’s one truism in fiscal policy, it’s this: Wasteful spending will always rise to the level of revenues. Whether you’re in Greece, Washington, D.C., or California, overspending is a prosperity killer of the first order. Mr. Gingrich’s flat tax proposals—along with his proposed balanced budget amendment—would put a quick stop to overspending and return America to fiscal soundness. No other candidate comes close to doing this. 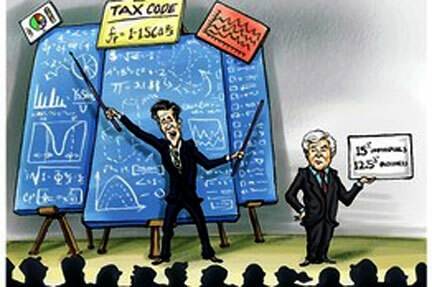 via Art Laffer: Why Gingrich’s Tax Plan Beats Romney’s | Newt Gingrich 2012. Occupy vs America – Which side will you chose?